Nadia Azzi - Aug 11, 1998 Dunedin, Fla.
Nadia Azzi was born in 1998 and was a student at The Center for the Gifted Studies Magnet Program housed at Dunedin Highland Middle School in Dunedin, FL. She began playing the piano at the age of five with Kinuyo Engelbrecht who taught her music theory. Her teacher was the renowned international pianist, Leonidas Lipovetsky, and she received additional tutelage from Dr. Grigorios Zamparas, a concert pianist and professor at University of Tampa. She has become the winner of numerous piano and music competitions at the county, district, state, national, and international levels. 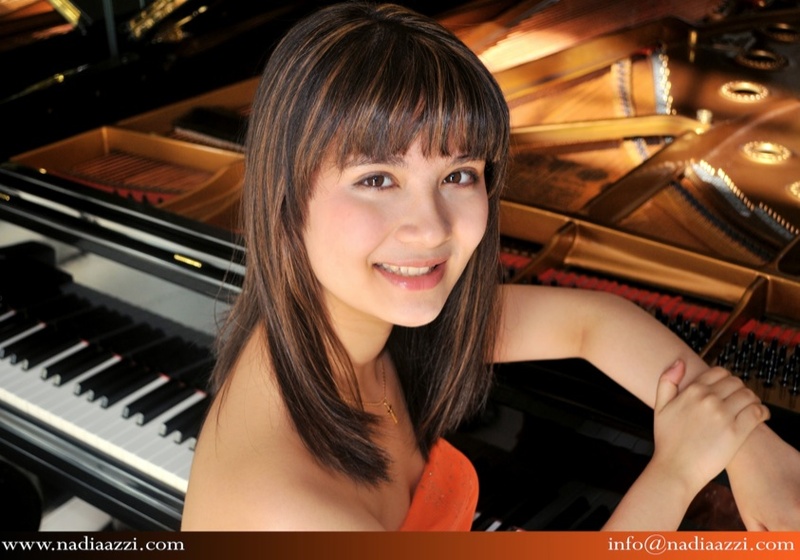 Some of her achievements include being the winner in the Early Music Open Junior Category at 2011 Walgreens National Concerto Competition held in Fort Sheridan, IL; 1st place winner in the 2010 Orfeo International Music Competition in piano category held in Vipiteno, Italy; Gold Medalist at 2010 Passion of Music International Music Festival and has performed at the Weill Recital Hall at Carnegie Hall in NY; the recipient of 2010 Ruth B. Lockmiller Memorial Award at FFMC; nominated for Irene Muir Memorial Award at FFMC; and other numerous awards/scholarships at FFMC and FSMTA piano competitions. In the past, she also had the honor of studying with Dr. Rita Fandrich of Florida Southern College, and had the opportunity of attending the 2010 Orfeo Music Summer Festival in Italy studying under Vladimir Khokhlov. She made her first orchestral debut in Cambridge, MA with the Boston Neo-Politan Orchestra in June of 2011, and attended the Aspen Music Festival and School that summer studying under Yoheved Kaplinsky of the Juilliard School. She also studies violin with Lei Liu, Second Assistant Concert Master at the Florida Orchestra. She became the concert master in the 2009-2010 All County Middle School Orchestra as well as the advanced orchestra at her middle school. Besides her music interests, she has excelled at many area of studies. She has won several awards such as 2010 MathMovesU Middle School Scholarship and Grant Program sponsored by Raytheon Company; 2009 Math P.R.I.D.E Award; and Award of Excellence in Odysseys and Expeditions at the Arts Center in St. Petersburg, FL. She is fluent in Japanese and English. She has attended Japanese pre-schools, and elementary schools for 2 months almost every summer since she was 3 years old. She received a bronze award in 2009 Fukui Prefecture Japanese Calligraphy Competition. Click for link to 'The Talent Notes' interview with Nadia - 23rd March 2013. 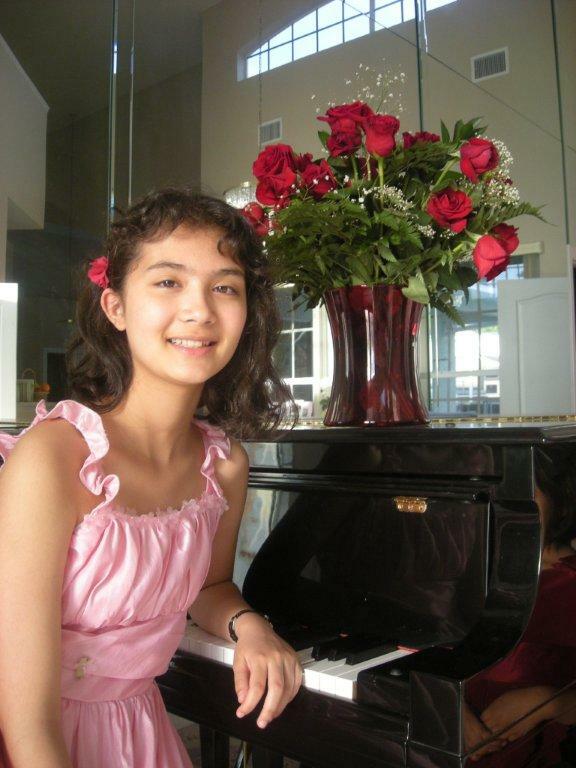 Nadia became the 1st place winner at the 2013 B&B International Piano Competition. 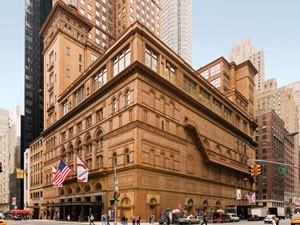 She will perform at Carnegie Hall (Weil) on May 19th, 2013 at 1:30 pm. Please come to the concert if you live around NY area!! She will also be performing in a chamber group at the Rosemary and Meredith Willson Theaterat at the Juilliard School on May 11th @ 7:00 pm, which is open to the public. Nadia performed Mozart Concerto No. 27 with Northwest Indiana Symphony on March 8th, 2013. It's located less than 30 miles from Chicago. 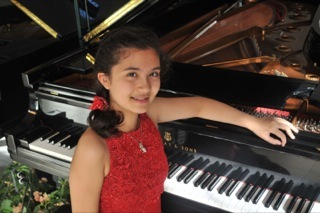 Fourteen-year-old piano phenomenon Nadia Azzi brought her impressive talents to perform Mozart’s Piano Concerto No. 27. Winning awards around the world, Nadia made her Carnegie Hall debut in 2010. The Symphony will also perform Berlioz’s extremely popular Symphonie Fantastique; his autobiographical masterpiece that ushered in the Romantic period in classical composition. 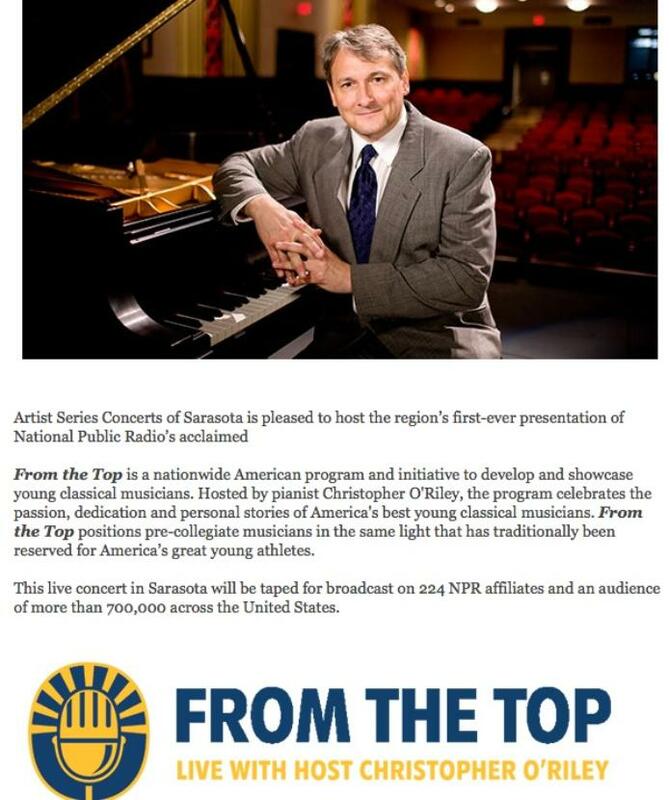 Nadia appeared on the NPR Show From the Top with host Christopher O’Riley at the Sarasota Opera House on December 11, 2012. Artist Series Concerts of Sarasota to bring Popular NPR Show From the Top with host Christopher O’Riley to Sarasota Opera House December 11, 2012. From the Top, the preeminent showcase for young musicians heard weekly on Classical WSMR 89.1 FM comes to Sarasota Opera House in Sarasota, Florida to tape a radio broadcast on December 11 at 7:30 pm. The popular NPR program hosted by acclaimed pianist Christopher O'Riley will feature the amazing performances and captivating personal stories of extraordinary young classical musicians from across the country. This episode will be presented by Artist Series Concerts of Sarasota. The broadcast taping will feature two local young musicians. 16-year-old horn player Kaitlyn Resler from Clearwater, Florida will perform Nocturno, Opus 7, by Franz Strauss, accompanied by Christopher O’Riley. 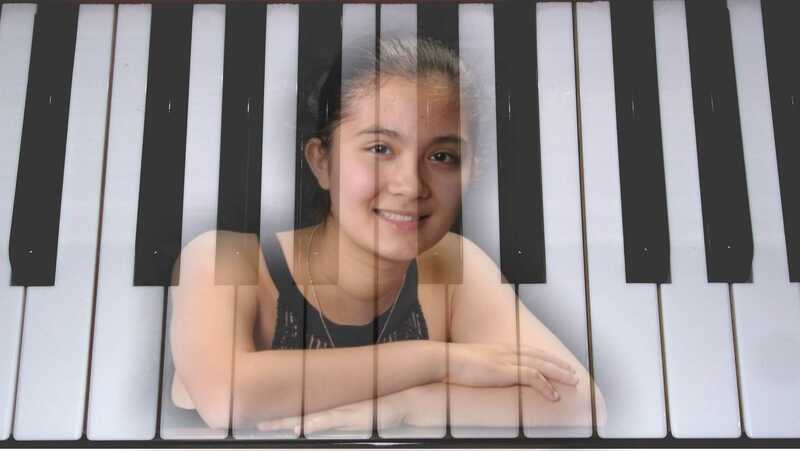 14-year-old pianist Nadia Azzi from Palm Harbor, Florida will perform the first movement from Sonata Number Two in G minor, Opus 22, by Robert Schumann. The broadcast will also feature local From the Top alum, 27-year-old cellist Abraham Feder, who is the principal cellist with the Sarasota Orchestra. Also on the broadcast will be 12-year-old violinist Kevin Zhu from Cupertino, California performing Carmen Fantasie by Franz Waxman, accompanied by Christopher O’Riley; and 14-year-old guitar player Jennifer Kim from Cypress, California performing Un Sueño en la Florestra by Agustín Barrios Mangoré. This episode will air nationally the week of January 28, 2013. From the Top may be heard locally on Classical WSMR 89.1 on Sundays at 5:00 pm. What began as a radio experiment in 2000 quickly became one of the fastest growing and most popular weekly classical music programs on public radio. Broadcast on nearly 250 stations nationwide to an audience of over 700,000 listeners, From the Top has been described by the Boston Globe as "an entertaining, accessible, and inspirational mix of outstanding musical performances, informal interviews, skits, and games, the show is a celebration of extraordinary musicians who happen to be teenagers leading fairly normal lives." Annually, From the Top's live tapings reach more than 20,000 live audience members of all ages across the United States. In conjunction with its national tour, through From the Top’s Center for the Development of Arts Leaders, the Boston-based non-profit offers leadership training to young artists and conducts classroom and community programs leveraging the power of its performers as role models for younger students. In addition, From the Top and the Jack Kent Cooke Foundation award $10,000 scholarships to high achieving musicians with limited financial means. The program has invested more than $1.6 million in support for pre-college students since 2005. From the Top launched its Emmy Award winning PBS television series From the Top at Carnegie Hall in 2007. From the Top's radio program is made possible through grants from the National Endowment for the Arts and the Jack Kent Cooke Foundation, and corporate underwriting from U.S. Trust, Bank of America Private Wealth Management. It is also supported through the generous contributions of individuals and institutions as well as public radio stations. From the Top’s founding partners are New England Conservatory and WGBH. Learn more at www.fromthetop.org. Shall we dance? Much of the world’s great music was based on folklore. This fabulous show brings the music, the stories and the dances all together. Fourteen year old prodigy Nadia Azzi has won top prizes in numerous competitions at the state, national, and international levels. She debuted at Carnegie Hall when she was just 11 years old! This phenomenally talented young lady excels both on piano and violin and will be featured in Grieg’s Piano Concerto and DeBariot’s Violin Concerto Scene de Ballet. The Bay City Ballet will present dances from Tchaikovsky's ballet based on the legendary story The Nutcracker and the Mouse King. The company is under the direction of Mark Jelks. Mark toured Europe with the Scottish Ballet and was a staff member of the American Ballet Theatre in New York. Tickets are $15.00 for open seating at the Center for the Arts at River Ridge. Show time is 3:00 p.m.
Download Ticket Order Form here. You will need Acrobat ® Reader to view and print the Ticket Order Form. You may download a FREE version of Acrobat ® Reader here. Recorded at The Elms (above), a large mansion at 367 Bellevue Avenue. Chopin Ballade No. 1 in G Minor for Anton Nel's masterclass at the Aspen Music Festival and School. Recorded at Harris Hall. Songs of Loss Love met me at noonday...by Aaron Travers - performed on June 14, 2012 at Grand Salon at the University of Tampa during the 2012 Minarat Chamber Music Workshop. Nadia Azzi performed Beethoven Concerto No. 2 Allegro con brio with the Tampa Bay Symphony as the winner of 25th TBS Young Artist Competition. Link to Phoenicia News (Arabic) report on the event. 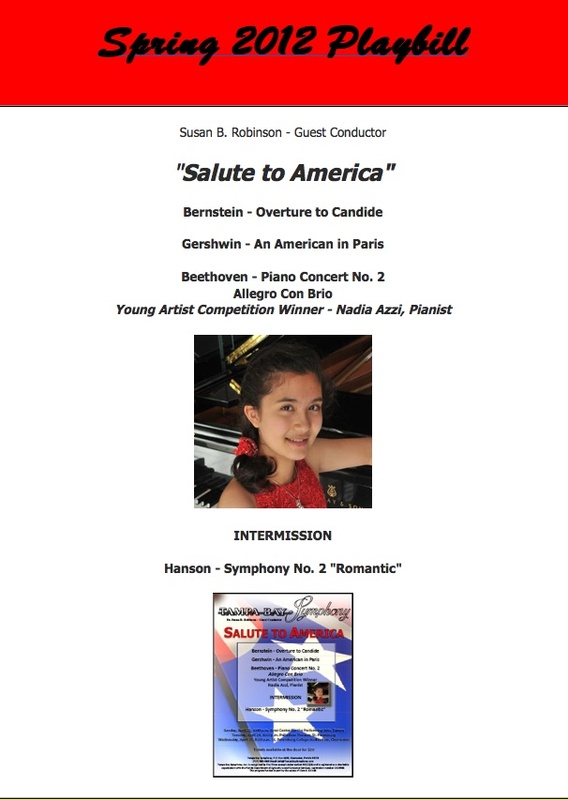 Forthcoming performances in 2012: Nadia performed at Carnegie Hall on 2/4/12 (4/2/12 in British English) and will perform a Beethoven Concerto with Tampa Bay Symphony in April after winning the Young Artist Competition. 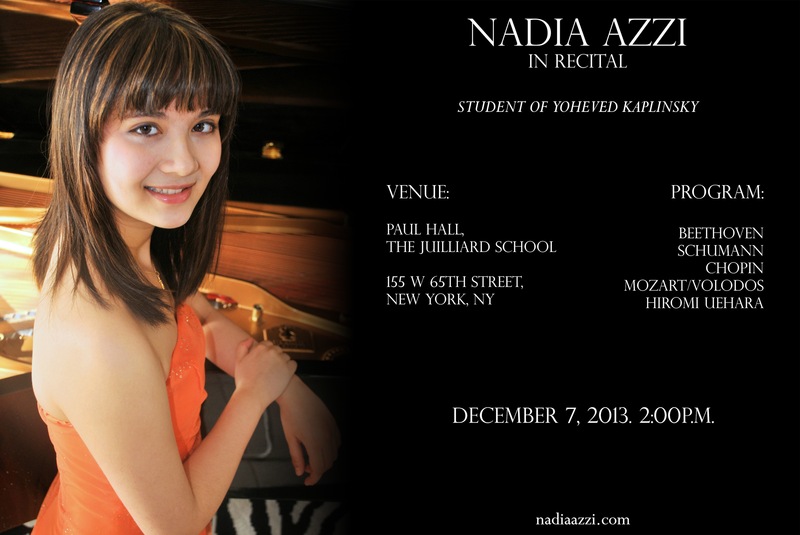 Join us as we kick off the 2011-12 STIM.U.LI series with a special performance by twelve-year old pianist Nadia Azzi, appearing in recital at New Music School on Saturday, October 29, 7 PM. Ms. Azzi took First Place in the NEW MUSIC National Young Artist Competition 2011, winning both Overall and ART+NEWMUSIC awards this past May. 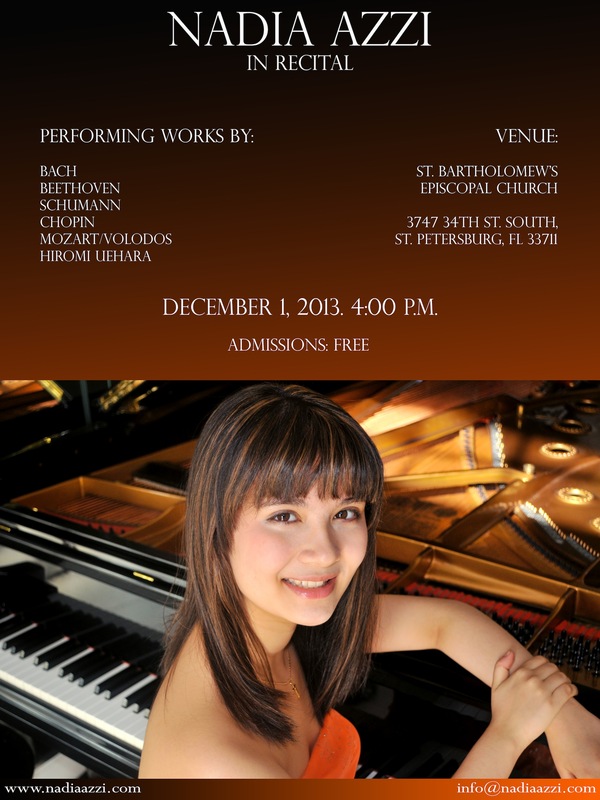 She will perform works by Mozart, Beethoven, Mendelssohn, Chopin, and the ART+NEWMUSIC 2011 selection. A special introduction by Augusta Read Thomas makes this an event not to be missed! Nadia will be featured and heard live on the WFMT 98.7 Chicago National Radio Program called “Impromptu” on 10/28/11 Friday at 4:00 pm (5:00 pm in the eastcoast - 10 pm London). While Dunedin Florida (pronounced DONE-EE-DIN) has a small town image, it is actually a bustling city of 37,000 residents. 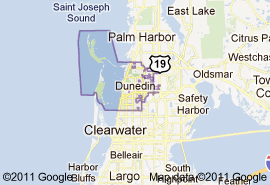 One of the oldest towns on the West Coast of Florida, it has a wooded and subtropical setting with almost four miles of picturesque waterfront, a relaxed lifestyle, and activities for all likes and ages, making Dunedin a truly delightful place to live or visit. 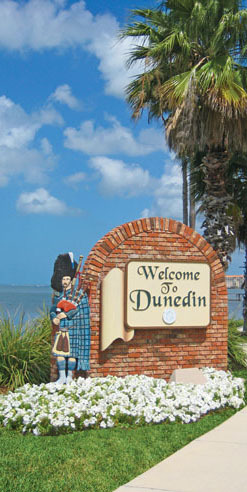 The Dunedin area enjoys near perfect weather, with an average summer high of 80 degrees and a winter low of 62 degrees. Average rainfall is 50 inches per year with the usual summertime afternoon showers. Just off the coast of Dunedin, the community is able to boast of two of its most unique assets, Honeymoon and Caladesi Islands. Honeymoon Island State Park is less than a five-minute drive from the mainland, and offers a natural getaway for boating, swimming, fishing, picnics, and nature exploration. Caladesi Island State Park, accessible to the public by ferry from Honeymoon Island or by private boat, has consistently been named one of Florida’s top ten beaches. This year Caladesi Island took the coveted #1 spot for the best beach in America according to Dr. Beach. Along the Dunedin Causeway to Honeymoon Island, within the protected waters of St. Joseph Sound, you will find all the sun and fun activities such as windsurfing, sailing, kayaking, canoeing, jet skiing, or just relaxing and listening to the surf. She combines with her versatile artistry as a recitalist, soloist, chamber musician, and even as an accompanist. She has become the winner of numerous competitions at county, district, state, national, and international levels. She recently competed at the 2011 New Music National Young Artist Competition in Chicago, IL and became the Winner of the Overall Award and the ART New Music Award. Gold Medalist at the 2010 AADGT "Passion of Music" International Music Festival; the recipient of the 2010 Ruth B. Lockmiller Memorial Award; nominated for the Irene Muir Memorial Award; and the 1st prize winner at the FSMTA/FFMC State, District, and County competitions in various categories for many years since she started competing at the age of 6 . 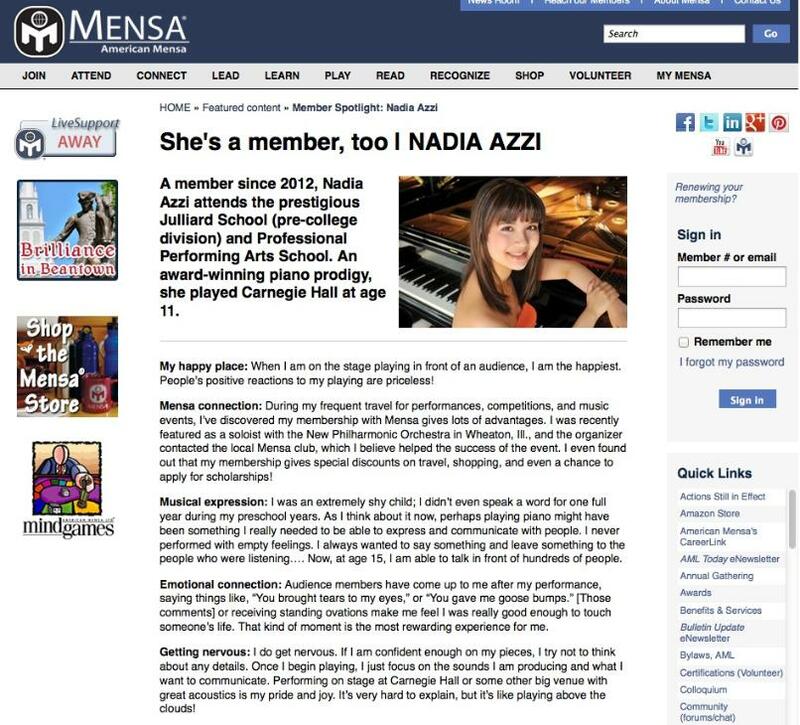 At the age of 11, Nadia performed at the Weill Recital Hall at Carnegie Hall in NY as the Gold Medalist at the 2010 AADGT International Music Festival. Since then, she had performed at the Teatro Comunale in Vipiteno, Italy as the youngest winner of 2010 Orfeo I nternational Music Festival Competition. On June 4, 2011, Nadia made her orchestral debut at age 12 performing Beethoven`s Piano Concerto No. 2 with the Boston Neo-Politan Orchestra in Cambridge, MA under the baton of conductor John Ceander Mitchell. She performed the original Finale (Rondo WoO6) for this program, "Mozart's Spirit through Haydn's Hands." Nadia will spend this summer at the Aspen Music Festival and School as one of the youngest participants accepted into the program. 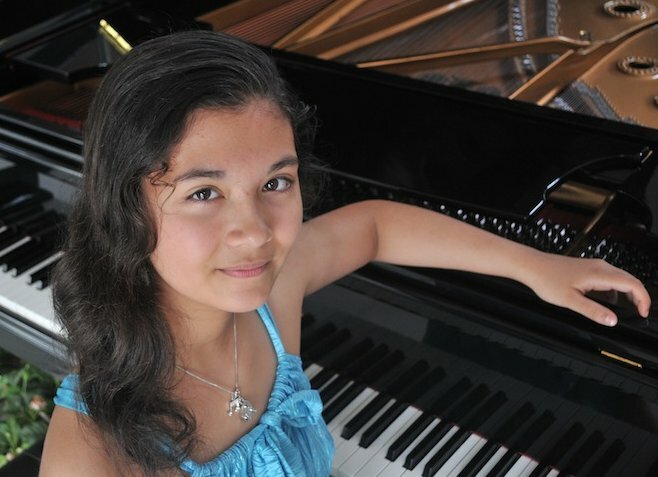 Winner of the 2011 New Music National Young Artist Competition, Nadia has been invited to perform her solo recital program at WFMT 98.7 Chicago in addition to the opportunity to be coached by composer Augusta Read Thomas as well as Ms. Mary Sauer of the New Music School and Chicago Symphony Orchestra. Nadia Azzi performed Beethoven Concerto No. 2 with the Boston Neo-Politan Orchestra conducted by Jon Ceander Mitchell at Cambridge, MA on June 4th 2011. Since the age of 6, she devotes her extra time to perform chamber music and for assisted living facilities and churches to connect with the elderly and the community. She is the featured soloist at the annual SAROA concert in Clearwater, FL with an extensive solo recital program. She also provides piano/harpsichord accompaniment at the Pinellas Youth Symphony Orchestra/Serenade Strings and the Bonnie Lads & Lassies Chorus. At the age of 10, Nadia has started taking violin lessons, and has become the concertmaster in the 2009-2010 All County Middle School Orchestra as well as the alternate winner at the 2011 FSMTA Concerto Competition. Besides her music interests, she is among the most academically gifted seventh grader at the 2011 Duke University Talent Identification Program. She has won several awards such as the 2010 MathMovesU Middle School Scholarship and Grant Program sponsored by Raytheon Company; 2009 Math P.R.I.D.E Award; and Award of Excellence in Odysseys and Expeditions at the Arts Center in St. Petersburg, FL. She is fluent in Japanese and English. She has attended Japanese pre-schools and elementary schools for 2 months almost every summer since she was 3 years old. She received a bronze award in 2009 Fukui Prefecture Japanese Calligraphy Competition. Born in Dunedin, FL to Japanese-Lebanese parents, Nadia began playing the piano at the age of five with Kinuyo Engelbrecht who is now teaching her music theory. 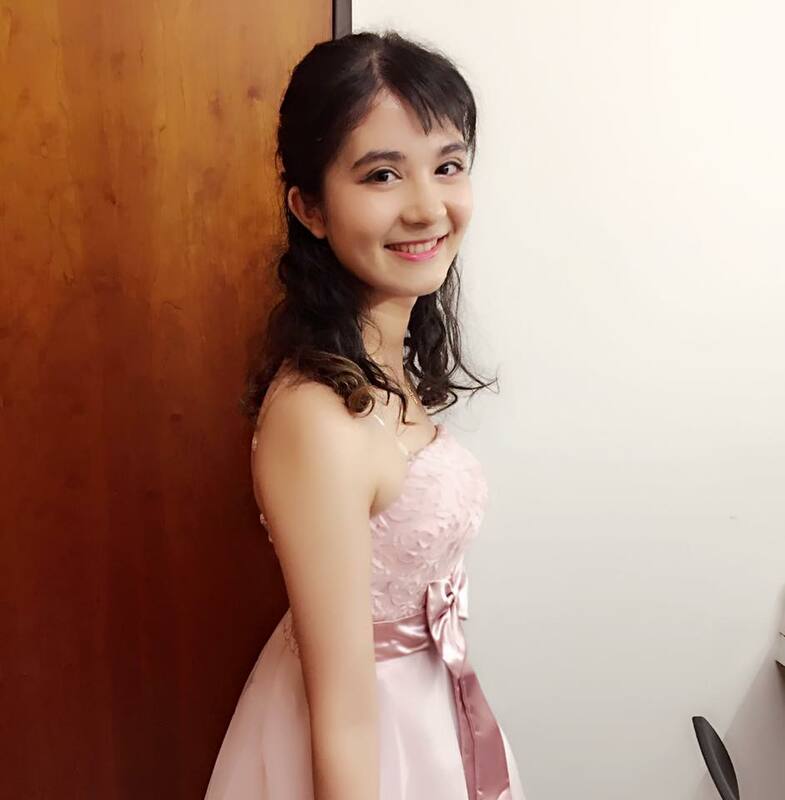 Her current teacher is a renowned international pianist, Leonidas Lipovetsky, and she receives additional tutelage from Dr. Grigorios Zamparas, a concert pianist and professor at University of Tampa. DUNEDIN — When she wakes in the morning, her fingers move along the pillow. 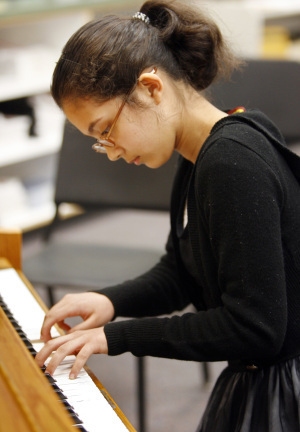 Eleven-year-old Nadia Azzi is playing piano in her mind. As a pre-schooler, her teachers worried she didn't know how to speak. Quiet and shy, she could get through a school day in virtual silence. Azzi's mother, Kaori Azzi, was a casual pianist in her youth. When pregnant with Nadia, she played a little Mozart in hopes of helping her new baby's development. She did not know this would happen. 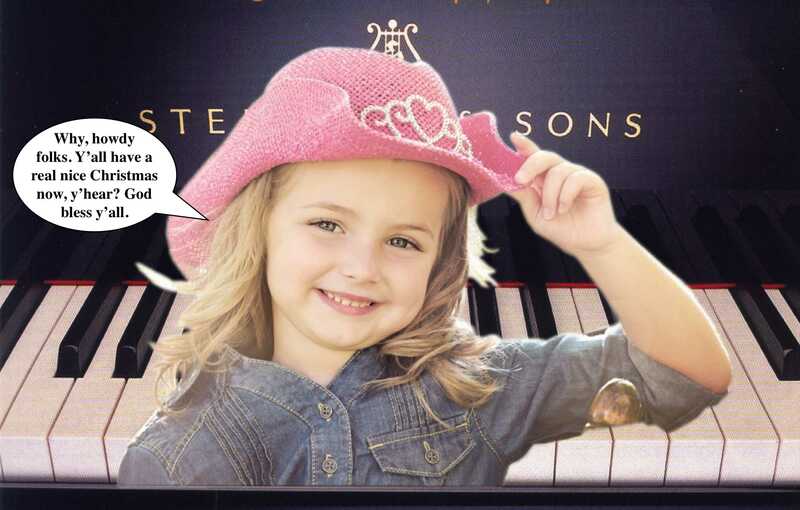 Nadia took her first piano lesson before she turned 5. On Sunday, she plays at Carnegie Hall. A week later, she joins some of Tampa Bay's finest classical musicians on a local stage. One teacher calls her a prodigy. She says she simply loves music. "I'm obsessed," Nadia confided Thursday in between orchestra class at Dunedin Highland Middle School and her violin lesson with Florida Orchestra member Karl Bawel. Oh, yes, she plays violin now, too. At the end of seventh period, Nadia's orchestra class wants to hear her play. The sixth-grader is 92 pounds and about 5 feet tall, a small person in this large, high-ceilinged room. As she approaches the seat on the upright piano, she kneads her thin fingers to warm and stretch them. Her eyes look down through her tiny glasses, her pony tail points up. Her legs are striped with black and white piano key knee-high socks. She sits on her poofy black skirt. Narrow shoulders hunch. And it begins. Fingers dance like jumping spiders, spreading and moving. Her black size 6 ballet flat pumps the piano pedal, pulling her weight from the seat then down again. In her mind, she imagines war and blood, what it must have been like in the composer's war-torn country of Armenia in the 1940s. Sound swallows the room, a succession of quick notes that signal power and fullness so much larger than she. She's practiced this. And practiced this. She spends at least 15 hours a week practicing on one of the three pianos in her family's Palm Harbor home. Then, she devotes another 30 to 45 minutes a day to the violin. Add to that once-weekly lessons both with Bawel and piano teacher Kinuyo Engelbrecht and two hours on Sunday with the Pinellas Youth Symphony. "Every night we have to fight that she has to go to bed," her mother says. "Otherwise, she will be playing until 2 or 3 in the morning." "Nice. Good," the teacher says as his student finishes playing a Bach air for violin. "What's your analysis?" "My bow needs to be flatter," she says standing before him. Bawel, a 30-year member of the Florida Orchestra, first met Nadia in September 2008. "I didn't have any expectations," he remembered. She was new to the instrument, said liked the way it sounded. Some of her friends played it. "It became very apparent at the very first lesson that she had some major talents," he said. "I've had some good students in the past, some very good students who have gone on to major orchestras. … But this one's special. Very special." Within a year, Nadia was concert master for the All-County Middle School Orchestra. She walked into her middle school and played her way into first chair for the advanced orchestra. "She gets a fullness out of it that she shouldn't at her age," Dunedin Middle teacher Katherine Laursen said. Nadia's developing so quickly on the violin that Bawel has decided he must relinquish her to another teacher at the end of the summer. Bawel is a trained violinist, but viola is his passion. To continue to challenge Nadia on the violin would mean reacquainting himself with violin pieces that are buried in his memory. "She's going so fast and at this stage of the game, I don't want to pull out those major concertos and relearn them," he said with a chuckle. Nadia is a little heart-broken about the transition. Bawel, she said, challenges her. He doesn't simply let her slide on talent. Bawel sees it another way: He's warding off ego by keeping her feet on the ground. Nadia will play the Khachaturian sonatina at one of the world's most famous music halls on Sunday during the International Young Musicians Festival. Her mother, worried Nadia would be rejected, had sent the audition tape in secretly. Nadia won a gold medal in her age group. At the end of their lesson Thursday, Bawel asked Nadia to put away her violin and play what she'd be playing at Carnegie Hall. She sat at his upright piano and swept the keys. When she was finished he asked: "What's your analysis?" "It needs to be louder at the end," she said. Rebecca Catalanello can be reached at (727) 893-8707 or rcatalanello@sptimes.com. WFMT Chicago Radio Proigram "Impromptu"
NMS National Young Artist Comp.